Let me just say up front: I don’t know squat about baseball. I see it as a somewhat inferior form of narrative, a gross theatrical spectacle with plenty of built-in conflict, tons of suspense and a ticking clock tension. But there are only two possible outcomes: win or lose. And no denouement. Just on to the next showdown. This is where it loses me. Nonetheless, I understand its place in the world. Certain people, mostly men, have a competitive drive hardwired into them and they need an outlet for it. I’m reminded of that argument I’ve heard intellectually sophisticated men give to yawning women: “You have to understand, baseball’s not like football. It’s not just brute physicality. There’s actually a lot of strategy in it.” Okay, strategy makes it a little more interesting. But, still, what’s it all for? This is the big advantage of making a movie about baseball over the game itself. Not only plenty of room for elucidating the strategy, but also the opportunity to make it all mean something. And this is why I like Moneyball, the story of Oakland A’s General Manager Billy Beane’s struggle to get his scouts, coaches and players on board with a game-changing strategy of using baseball statistics to capitalize on the hidden strengths of undervalued players. Specifically, what I like about Moneyball is that it is not simply an underdog-coming-from-behind-to-triumph-over-adversity story. It is thematically rich, making resonant statements about things like, for instance, brains over brawn. And not just cold, calculating brains, but the human benefits of using a scientific approach to value people for their best capabilities. Neither is it posing brains against heart. It is putting thought and emotion together against mere physical strength and so-called “instinct” that mostly amounts to unconscious bias. You could also say its about getting away from simply exploiting people to serve your own interests and, instead, evaluating them realistically to bring out their strengths. All of this is applicable to many more areas of life than just baseball. Imagine if our whole educational system were based on maximizing strengths rather than measuring weakness. I also like how the filmmakers met the challenge of making statistics interesting to watch on screen. They used a bit of computer data, a bit of marker board, and some videotape playback to get across the basic information. But what we need to know most about the statistics they managed to embody in the character of Scott Hatteberg. Due to an elbow injury, Hatteberg can’t throw the ball anymore, which, by the old way of measuring value, means he’s done. When we first see him, he’s sitting on the couch, depressed and demoralized, watching TV. 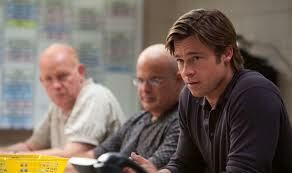 I love the way the writers put Billy Beane on his cell outside the front door asking to be let in. In academic screenwriting terms, this might be considered the cheesiest move in the book since it’s clearly motivated by the need to avoid that thorny problem of having drama-filled events happen over the phone. The reality is that these deals are actually done in tedious phone calls between agents and lawyers. But we don’t care about reality. We want to see the emotional truth. We want to see Billy walk into a washed up player’s dark and dreary environs and bring a beam of rejuvenating light. And this is the main thing we need to know about these statistics – they have the power to renew life where all hope seems lost. Then they use Hatteberg’s story to embody Billy’s struggle to get Oakland A’s Manager, Art Howe, on board with the new plan. After under-utilizing Hatteberg for the entire season, finally, at the critical moment, Howe comes around and Hattie hits one out of the park, literally. Thus, we see the statistics pay off not only in winning the record-breaking game, but also in Hatteberg’s personal vindication after having been professionally dismissed. Another thing I like is the way they used the Peter Brand character, who, as the only main character not based on a real person, is a composite of several who worked with Beane to put the statistical method into effect. In developing this character, it’s as if the writers set out to personify the statistics themselves, like a roly-poly muppet character on Sesame Street. Peter Brand is unsexy, nerdy and socially ill at ease, but cute in his own way and, when Beane finds him, he has been undervalued by his employers, just like the statistics. But Peter Brand is also more than just a human computer. He carries a lot of heart for such a numbers nerd. The whole reason he’s in this business is that he’s passionate about baseball. He shudders and recoils at the idea of having to cut players and he works really hard at the end to get Billy Beane to accept that he has not lost at all. On the contrary, he has hit a (metaphorical) home run. And I especially liked – no, I have to say I loved – the long, knuckle-biting build up of tension from Game 16 to the eleventh hour clincher of Game 20. This is not just any old tension sequence. This is tension that means something. See, for the fans cheering in the stands, it’s a big win, but it’s really just another win. For us watching in the movie theater, there is much more at stake. It’s the validation of everything Billy’s been doing for the last year. The tension is so much greater and the win is so much bigger because of knowing what it means. But, even with so much that I like about this film, I can’t shake this gnawing feeling that it’s missing something. I have to admit, I am a little cowed at the idea of finding fault in the work of Aaron Sorkin since I am a big fan. But it’s that ending, with the daughter. It feels a little too convenient. I wish there were a little more character development to support it, a sense that something significant has happened internally for the main character in addition to the plot triumph and all the resonant themes. I suppose one could argue that a story so intelligent in its thematic statements (which Sorkin excels at) doesn’t need a character transformation on top. My response to that is – Maybe. But it would be much better with one, especially if the character transformation further supports the theme. I don’t know what the real story is, but the film is clearly leading us to believe that Beane passed up the $12.5 million offer from the Boston Red Sox so as not to be far away from his daughter. This is apparently the function of having the daughter in the film, so that she can provide us with that ending. What would be nice, though, is if we could experience his turning down the job in order to stay near his daughter as a personal triumph for him. Rather, it is posed as the generically right thing to do. By generic I mean it is not individual to that character. Part of what bugs me about the whole daughter thread is that we just keep seeing Billy Beane being the perfect parent. But imperfect parenting affords so many more dramatic opportunities. And it’s more true to life. What mother or father has the luxury of being the perfect parent 100% of the time? Here’s where I see an opportunity missed: When we first learn he has a daughter, off-handedly in answer to Scott Hatteberg’s question, it’s a surprise because we’re pretty far into the story and there’s been no sign of her until this point. It’s clear right away that Casey doesn’t live with him and there’s even a hint of pain in him about it. Then we go to him picking her up at her mother’s house and we get the divorced Dad backstory. But the pain that was hinted at has disappeared and is never seen again. Thus, an opportunity is lost. The cell phone discussion is also generic and, therefore, a lost opportunity. It’s a discussion that any two estranged parents could have. But what if it that little tension moment sitting in the living room waiting for Casey was around something more directly reflective of opposing parenting styles? Let’s say Beane’s ex-wife is a stage mom. By the looks of that house, she likely lives in Malibu. Maybe she’s in the music or entertainment business. Maybe she’s been pushing the daughter to sing and play guitar and tap dance for her friends at parties (I’m just making this stuff up). Maybe while he’s sitting in her living room waiting for Casey, the mother proudly announces that Casey won an audition. He joins in the celebratory mood until he learns that taking the job will cause her to miss school. What if he considers it his job to keep the mother’s influence in check. But this is an internal challenge for him because he has his own impulses to be over focused on winning. Maybe the statistical method teaches him something about how he can reward Casey’s strengths without fostering unrealistic fantasies. Obviously, this may be taking the story pretty far afield from the real story. I’m only offering it as a way to illustrate the blandness of the existing Billy/Casey scenes. In fact, Casey’s character seems to exist purely to serve the convenience of the writers. She doesn’t have a lot of character of her own. What if by the time he is faced with the offer from the Red Sox, we have a clear understanding of his internal conflict between wanting to win and wanting to make sure his daughter doesn’t make the same mistake he did? He is telling his daughter not to chase the money, but to stay focused on school. Then he gets caught up in the lure of the $12.5 million Red Sox offer. He is at risk of contradicting himself. This makes his decision to decline a much clearer commitment to his daughter’s future. It is an action that proves the truth of what he’s claiming to believe.